My 20-hour, 11-disc Cookery DVD Collection is on special for just $60 for the month of February. This is inclusive of postage and handling, anywhere in Australia. Hurry since stocks are limited!!! Respond to this post now to take advantage of the great offer! Please note that this offer is only for those residing in Australia. 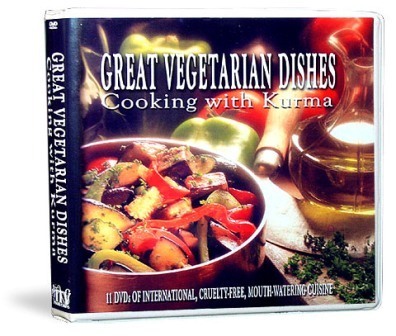 INDIAN ENTREES Includes scrambled Panir cheese; sweet and sour glazed carrots; North Indian red bean curry (Rajma); green beans sauteed in yogurt and poppy seed sauce, and many more recipes. Colour 111 min. SOUPS, RICE, SAVOURIES & CHUTNEYS Includes whole green mung bean and tomato soup; creamy vegetable soup; rice pilaf with nuts and peas; deep fried cauliflower balls in tomato gravy (kofta); apple chutney; fresh tomato and cucumber Raita, and many more recipes. Colour 111 minutes. BREADS, DRINKS & DESSERTS Includes basic unleavened whole wheat breads (chapatis); flaky pan-fried breads stuffed with green peas (parathas); sweet yogurt smoothie (Lassi); rose sherbet; classic semolina Halava; traditional vanilla sweet rice, and many more. Colour 109 minutes. EAST MEETS WEST LUNCH, BUFFET & DINNER Includes tofu steaks; rainbow brown rice; potato and cottage cheese rolls with cranberries; baked, stuffed avocados… Colour 90 minutes. ASIAN-STYLE LUNCH, BUFFET & DINNER Includes Indonesian vegetable stew; Thai vegetable curry; Malaysian hot noodles with tofu; vegetarian spring rolls & more. Colour 82 min. MEDITERRANEAN LUNCH, BUFFET & FEAST Includes Italian fried corn bread (Polenta); Turkish nut pastries in syrup (Baklava); spinach filo triangles (Spanokopita); Moroccan couscous with vegetable sauce; stuffed vine leaves (Dolades); and many more mouthwatering recipes. Colour 90 min. NORTH INDIAN LUNCH I, II & SOUTH INDIAN DINNER Includes cauliflower and potato supreme; peanut and coriander chutney; savoury wholemeal pancakes (Dosa), and many more recipes. Colour 90 min. MEXICAN-STYLE BUFFET, MIDDLE EASTERN ENTREES, ITALIAN LUNCH I & II Includes vegetarian chili; baked, stuffed cheesy corn breads (Enchiladas); Israeli chickpea croquettes (Falafel); Lebanese bulgur wheat salad (Tabbouleh); eggplant Parmagiana; potato dumplings with tomato sauce (Gnocchi), and more. Colour 120 min. SUMMER PATIO LUNCH I, II & III; THE COMPLETE GOURMET MEAL Includes ricotta cheese-filled pastries (Calzone); summer chilled fruit soup; sweet potato pie; baked cheesecake; savory samosas; fresh coriander chutney, and more. Colour 120 min. INDIAN FEAST I, II & III Includes Bengali royal rice; yeasted, puffed fried bread (Khamiri Poori); date and tamarind sauce; curried chickpeas; tomato, peas and home made curd cheese (Matar Panir); and many more. Colour 90 minutes. THE VEGETARIAN SMORGASBORD, PICNIC & CHILDREN’S PARTY; HOME-STYLE LUNCH Includes potato & pea croquettes; vegie nut burgers; asparagus & tomato quiche; North Indian potato salad; carob fudge cake; shepherd’s pie; steamed cauliflower salad with eggless mayonnaise, and many more recipes. Colour 120 minutes.